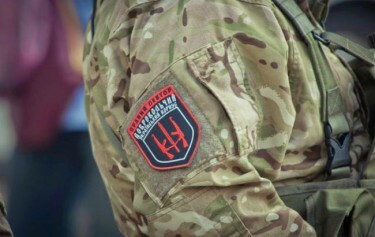 Paratroopers tried to disarm Volunteer Ukrainian Corps “Right Sector” in Dnipropetrovsk Region. Units of 95th Airborne and 25th Paratroopers Brigade set checkpoints around “Right Sector” base in Velykomykhailivka village in Dnipropetrovsk Region. Velykomykhailivka is located out of so-called Anti-Terrorist Operation zone, and any military activity in this area should be regulated by Ukrainian laws that don’t allow to use Ukrainian Army to maintain public order. Dmytro Yarosh also gave his comments on the situation. Our base was blocked without any warnings by units of 25th and 95th Paratroopers Brigade, they used armored vehicles and heavy weapon to set checkpoints with young, recently mobilized soldiers. They stopped one of our cars, and demanded from warriors to give up their weapon. When I called Viktor Muzhenko the Chief of the General Staff, he didn’t respond right away and we couldn’t immediately discuss the situation. Although, that was obvious that without the order from General Staff this operation couldn’t be done. I contacted Paratroopers commanders, we used to fight together, and military commanders guarantied to me that they will not use weapon against their brothers from “Right Sector” regardless the worst orders that can be given by politicians. I gave orders to all units of “Right Sector” not to give up their weapon. Nobody can forbid us to protect our land and fight against Russian aggressors. At the same time we will not respond to provocations… I see that military and political administration decided to provoke the conflict deliberately. They want to push “Right Sector” warriors to take illegal actions towards Ukrainian Army soldiers in order to discredit volunteer corps. This provocation will not work. We got our weapons fighting against the enemy. The actions of military command today is exceptionally cynical and meanness provocation against the patriots of Ukraine. Now the situation of the territory of “Right Sector” base is under control, the guards are on duty. People are in good mood, we got used to provocations long time ago, and we are not going to fight against out friends in arms, we will not do that for the joy of shameless politicians. As People’s Deputy I will demand detailed investigation on this incident. Political and military administration is responsible for the provocation and attempt to initiate a conflict between army soldiers and warriors of “Right Sector”. I hope for fast reaction from the Power regarding this case. I want to hear response, what was the reason to make this provocation against one of the most battle-worthy Ukrainian units on the front. At about 11:29am today the Ministry of Defense of Ukraine made a post regarding events that happened near “Right Sector” base. You can read original post in Ukrainian here mil.gov.ua. Below is translation into English. The training of Ukrainian Army Paratroopers units in Dnipropetrovsk Region continues. All messages spread around the Internet now regarding the situation in Dnipropetrovsk Region are trying to increase the degree of tension in society and can be used as pre-text for military provocations on the territory of Ukraine during May holidays. We want to remind that the position of the General Staff of Ukraine remains unchanged. All armed groups on the territory of Ukraine should be legal and obey Armed Forces of Ukraine or other state security forces. Later today at 13:14 Hromadske.tv reported that Dmytro Yarosh arrived at “Right Sector” base in Dnipropetrovsk Region on a helicopter. He came for negotiation with a general of General Staff of the Armed Forces of Ukraine. It hasn’t been reported yet who is this general.The negotiations are going on behind closed doors. According to worriers of the Volunteer Ukrainian Corps who are there, the general assured them that the base is not blocked and that’s just movement of troops around it. At the same time the head of headquarters of 5th battalion of Volunteer Ukrainian Corps Oleksandr Karas “Podolyanyn” in his comments to Hromadske.tv reporters who are at the place now said that there are already 11 checkpoints set around “Right Sector” base. There 20-25 soldiers of Armed Forces of Ukraine at each checkpoint. According to Oleksandr Karas they dig trenches and they have armored vehicles and machine guns, machine guns are covered, but directed towards Volunteer Ukrainian Corps base. The reporters of Hromadske.tv passed by one of recently built checkpoints on the way to Volunteer Ukrainian Corps base. They confirmed that there were 20 soldiers of Armed Forces of Ukraine, but they refused to say which brigade. 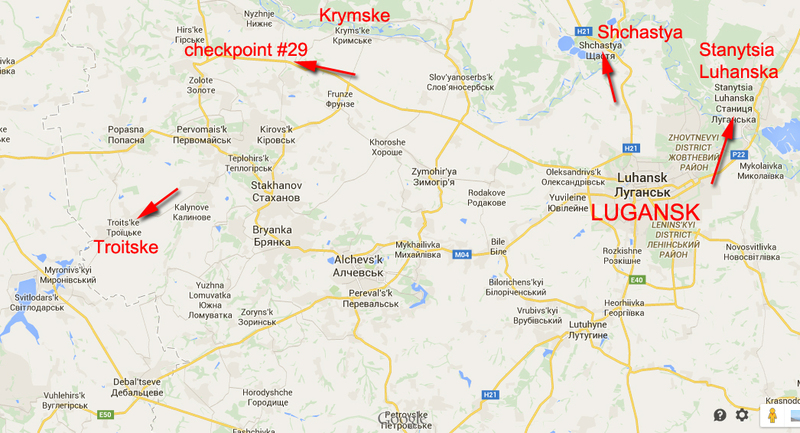 Their checkpoint was 500 meters from “Right Sector” base. Terrorists of LPR attacked Ukrainian Army positions near Tryokhizbenka. 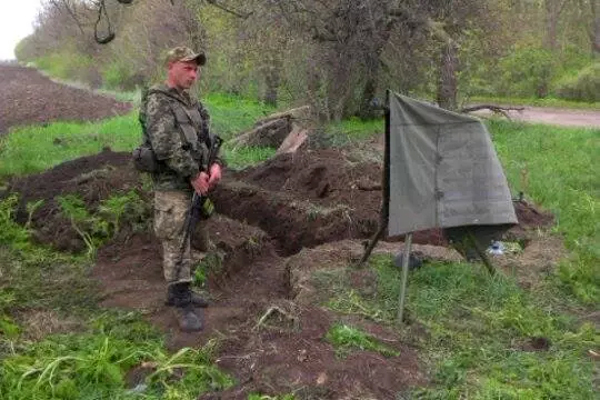 Today April 29 early in the morning there was a fight between Ukrainian soldiers and terrorists of so-called Lugansk People’s Republic near Tryokhizbenka village. A group of terrorists approached destroyed bridge over Siverskiy Donets River located on demarcation line and they opened fire at the direction of Ukrainian Army positions, first they used sniper riffle and later automatic weapon. The fight started, three Ukrainian soldiers were wounded (2 of them seriously). After the fight terrorists were pushed back, now at 10:30, it is quiet in Tryokhizbenka. Wounded soldiers are transported to a hospital. 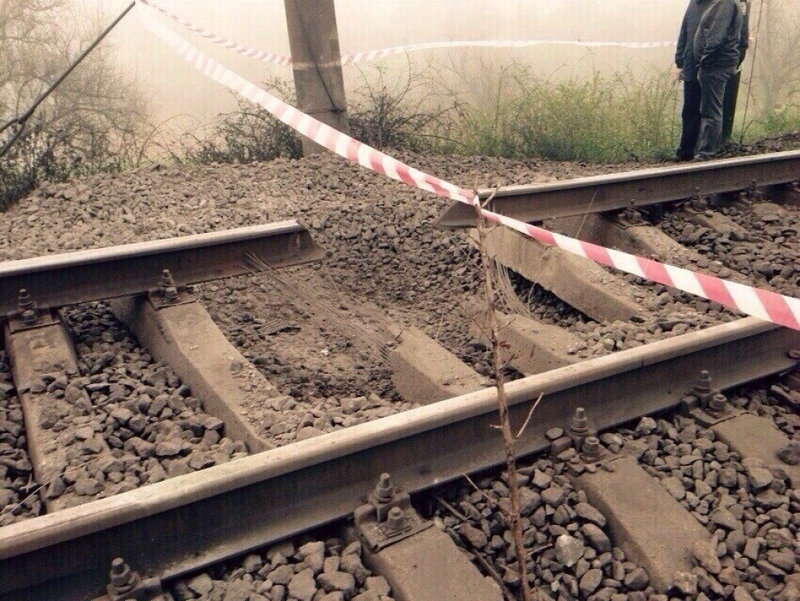 Railway track near Odessa in Ukraine was blown up today. 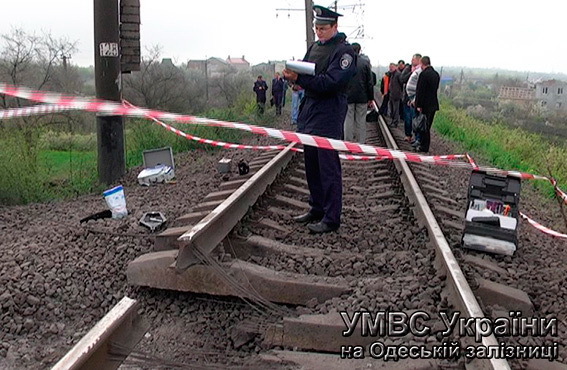 Today at about 6am police department of Odessa Railways got a phone call about explosion on a railway track between Ksenievo and Akkarja train stations near “Pos.pl.25 km” station located in Odessa Region. The explosion happened at 05:21am when electric locomotive was moving there. 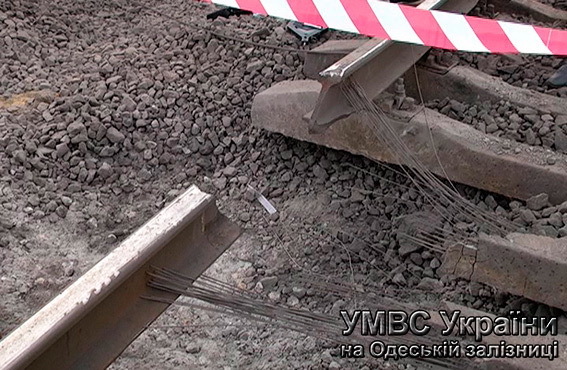 As a result, 50 cm of railway track was damaged, there was a crater 80 cm deep and 1.5 meters in diameter. Nobody was hurt or wounded. 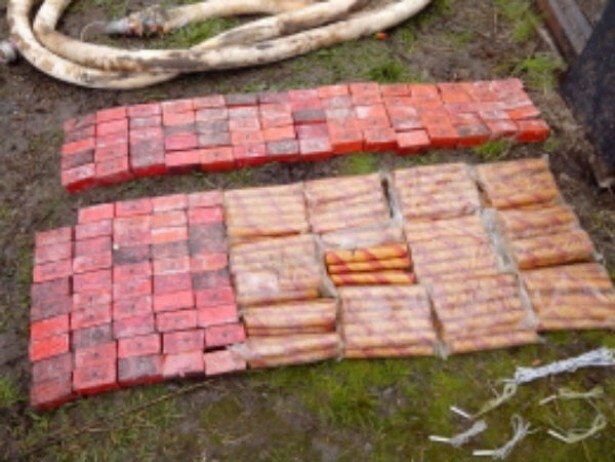 Police initiated operational plan “Explosives”. Investigators and technical team arrived to the place. 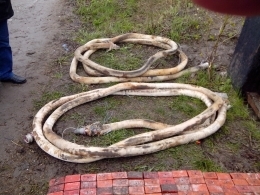 Two houses got on fire after LPR terrorists shelled suburbs of Shchastya city. Yesterday evening terrorists of so-called Lugansk People’s Republic shelled Shchastya city from their positions at Vesela Hora using different type of weapon, including anti-aircraft gun, automatic grenade launchers and machine guns. At about 6pm two houses in the suburbs of Shchasya got on fire as a result of shelling. Another grenade fired from automatic grenade launcher hit three storied residential building on Gagarina st. Fortunately, nobody was wounded among civilian population. There is also no info about killed or wounded among military. Today in the morning in was quiet in the city. 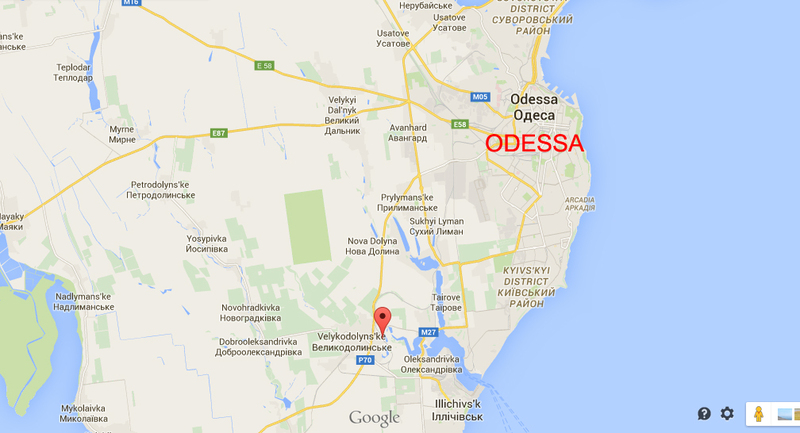 There was military activity in few other villages located on the demarcation line. In the suburbs of Krymske near tuberculosis dispensary in the evening and at night there was shooting between Ukrainian soldiers and terrorists and it repeated few times. Today after 11am in Krymske people could hear sounds of explosions that were coming from the Bahmutka road near Zholobok village (occupied by Russian troops) and Ukrainian checkpoint #29. 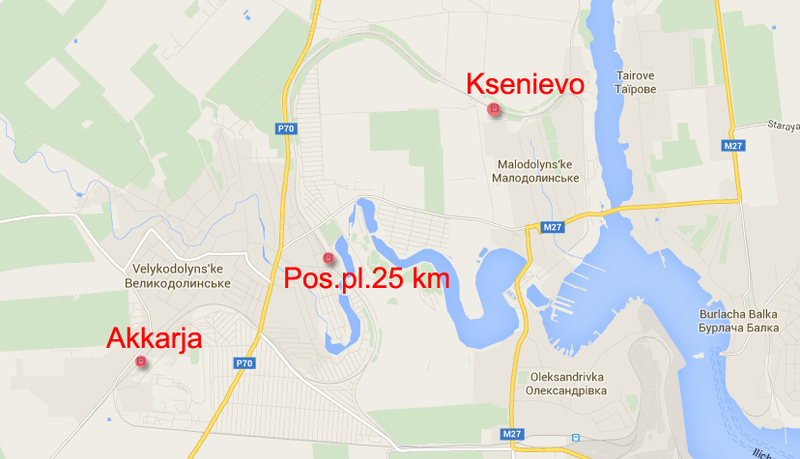 Troitske (located near Debaltseve) was shelled few times from mortars and automatic weapon. 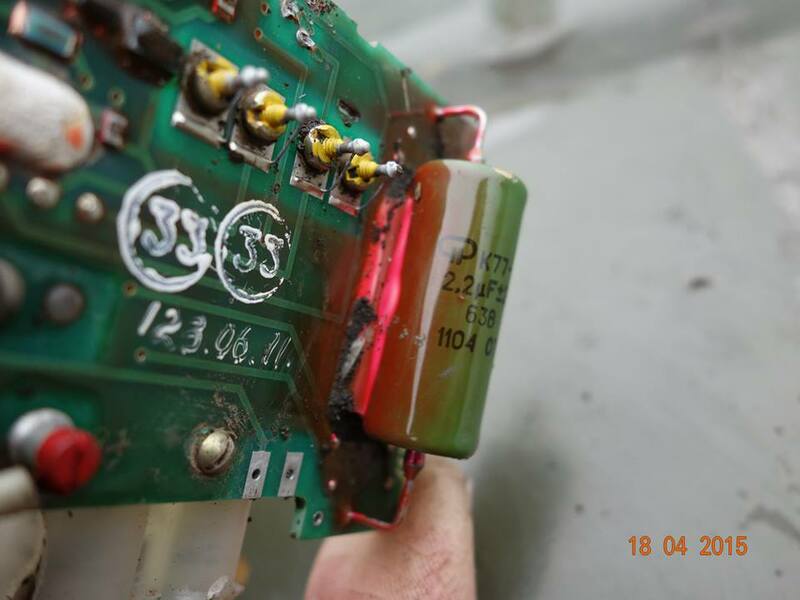 One of the mines exploded on a farm and caused minor damage. Today at about 11:30am enemy tank platoon lined up on front of Ukrainian Army positions from the side of occupied Kalynove village. Now there is no military activity in Troitske area. On the rest of the territory of Luganks Region is quiet. 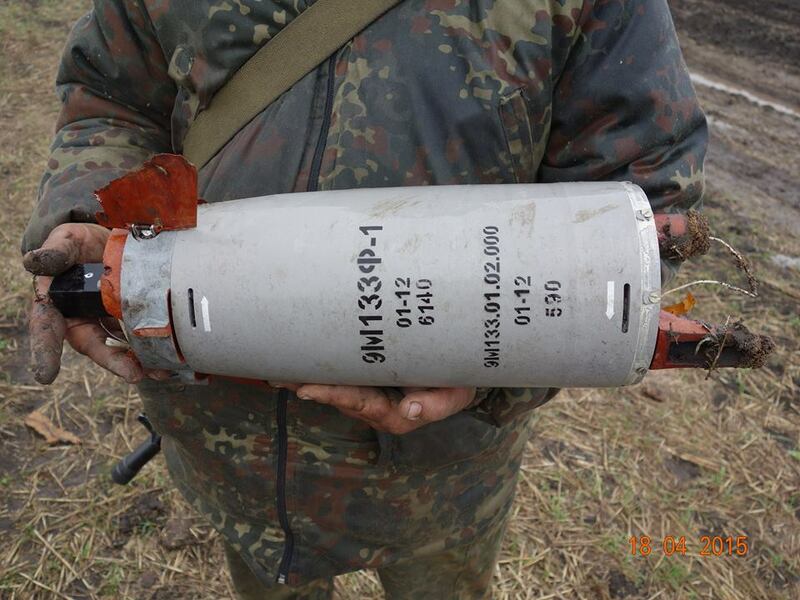 Another proof of Russian weapon ATGM 9M133f-1 Kornet used in Ukraine. 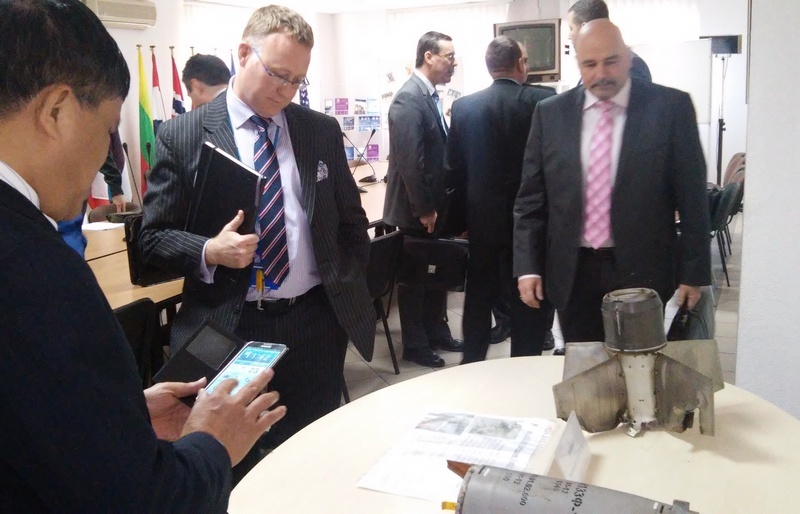 Representatives of Military Cooperation and Peacekeeping Operations Directorate of General Staff of the Armed Forces of Ukraine presented another proof of the use of Russian weapon on the territory of Luhansk and Donetsk Region to Kiev Association of Military Attaches. 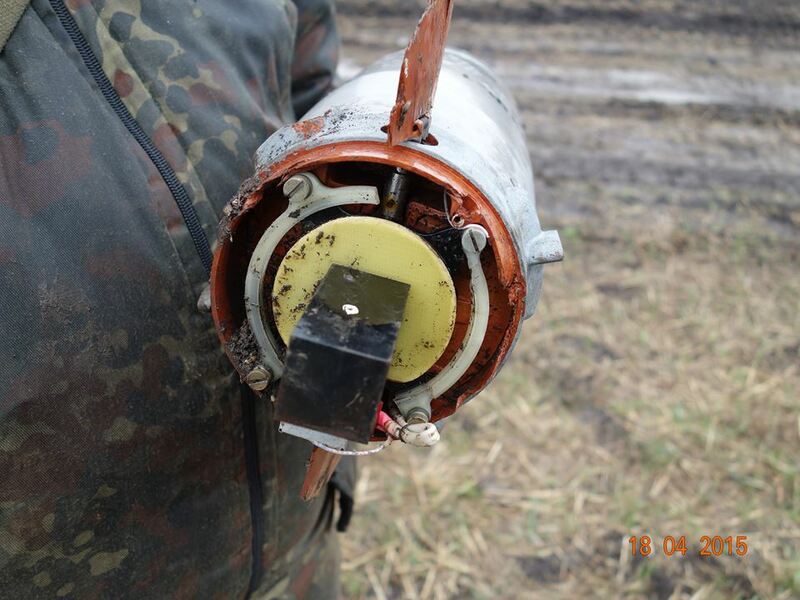 Few days ago Ukrainian platoon stronghold near Zholobok village (located in Lugansk Region) was shelled by Russian aggressors who used anti-tank guided missile system 9M133 Kornet (modification 9M133f-1, the rocket with thermobaric warhead) manufactured in 2012 (according to marking), likely due to technical problems it didn’t explode and it was presented to the world society in Kiev. 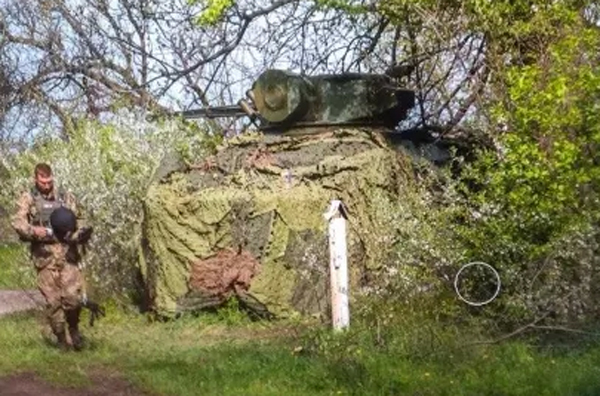 Russian ATGM 9M133f-1 Kornet with marking on it. 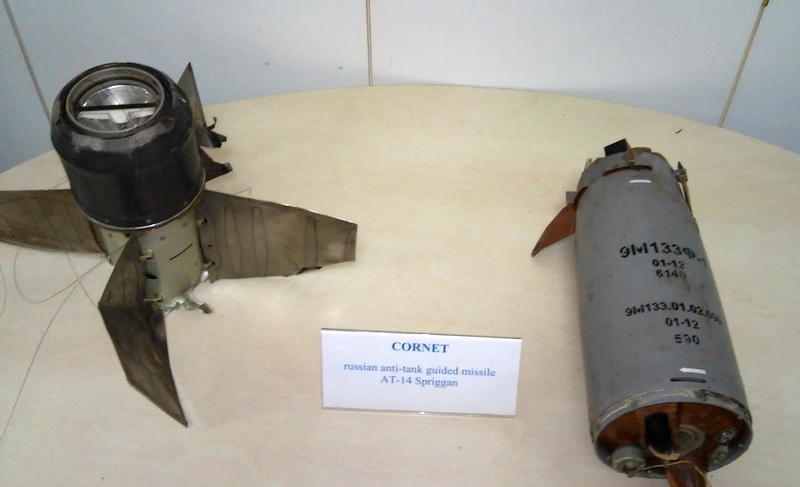 This type of weapon manufactured in 2012 on the territory of Russian Federation according to the marking and it is used by Russian Army. 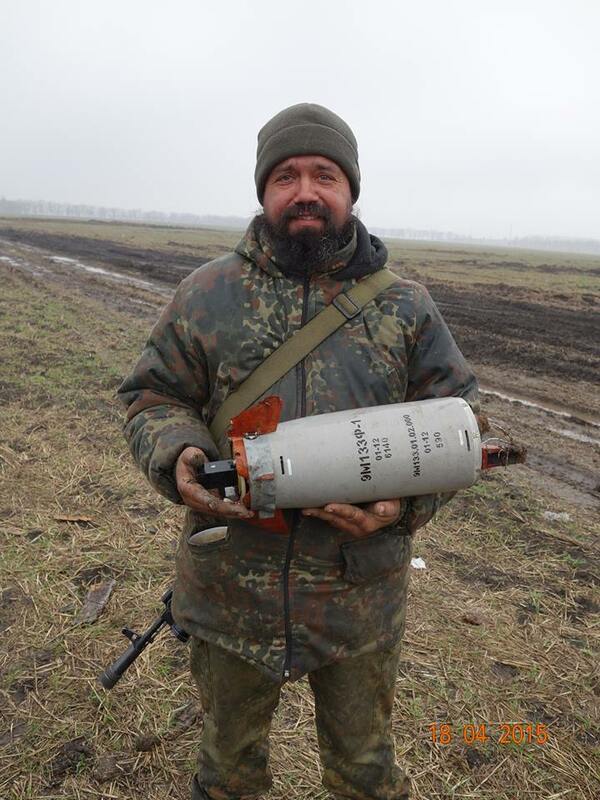 Ukrainian Army doesn’t have such kind of weapon! 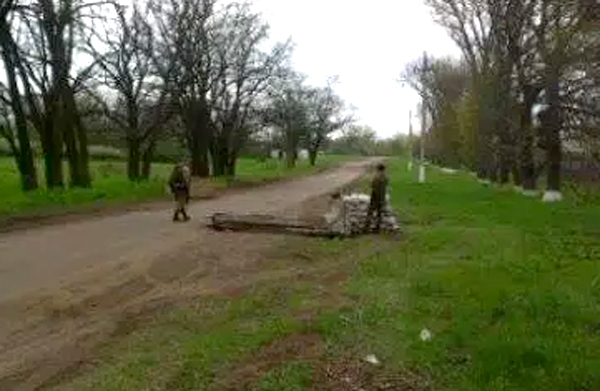 Ukrainian checkpoint #29 located near Zholobok village controlled by Russian forces was attacked on April 18 2015. Below we post all those 10 photos that are much better quality than photos posted by Military of Defense of Ukraine. 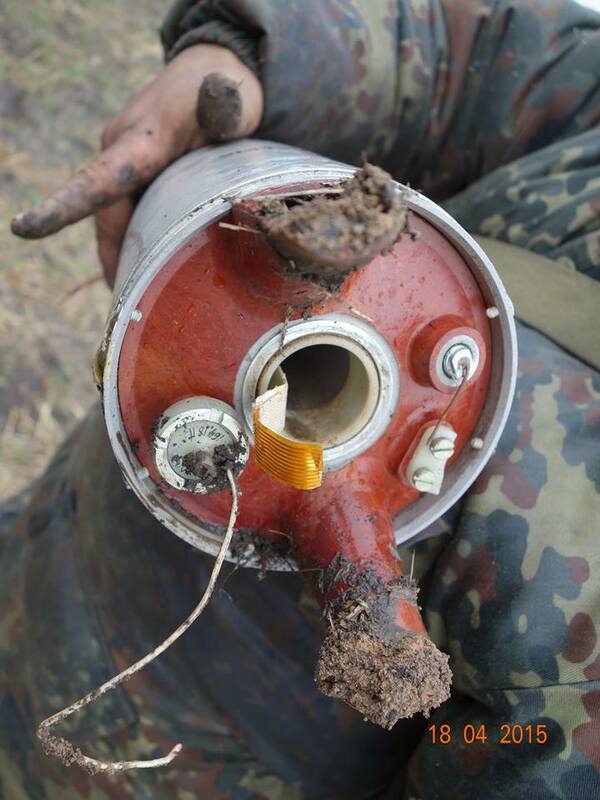 The photos were taken by Ukrainian soldier right after attack when they found the warhead of the rocket. 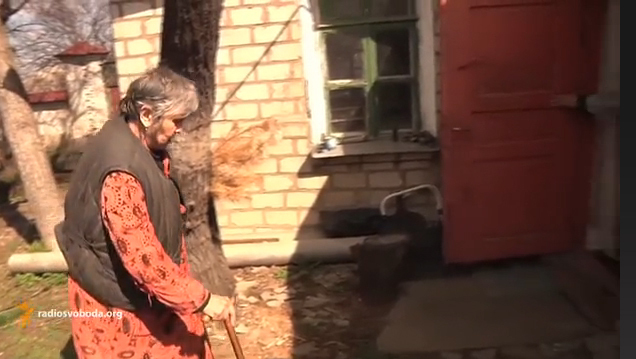 Retired people of Lugansk are starving, but pay for utilities. In Ukraine people of Lugansk, a city under control of so-called Lugansk People’s Republic for almost a year now, are starving, but continue to pay for utilities. Retired people who are most disciplined get in a line at cash windows. Last week they started to get pensions for April in rubles. When they got it, conscientious old people compared utility meters with the bills they got and came to branches of former “Oshchad Bank” and “Ukrposhta”. But there are some people who started to pay the bills as soon as shelling stopped and utilities offices started to operate, like “Gorgaz” (gas), “Gorsvet” (electricity) and “Gorvoda” (water). They were paying cash in those offices. Aleksandra Semenovna complains that they don’t take rubles (RUB) in many places, they prefer hryvnia (UAH). Banks have such rules. Retired people confess that they were saving for funerals and had to give that money in order to survive. Olga Ivanovna still has some hryvnias (UAH) saved. The woman survived more than one war, so since last spring she started to get ready and started to collect Ukrainian hryvnias. 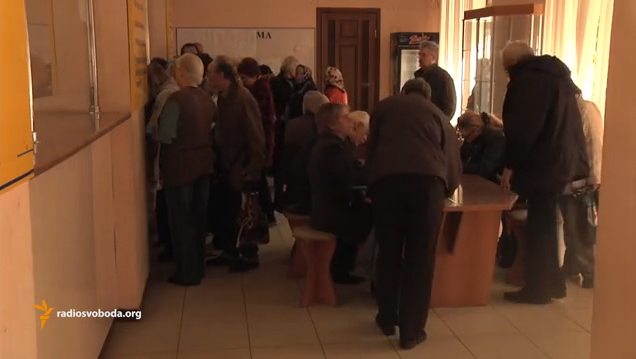 Only 20-30 percent of Lugansk population are paying bills for utilities. Many people have no food. Kirilovs family is one of them. Svetlana Aleksandrovna hasn’t seen her pension that she got for working on a plant for the last 10 months. Svetlana Aleksandrovna says that in order to heat her old house that has many cracks in it, they used a lot of natural gas. And now they still use heating as 2 years old granddaughter Nastya lives there with her grandmother. The woman says that controllers regularly come to them to check the utilities meters, but they have nothing to promise them. There is not a dime in a house. 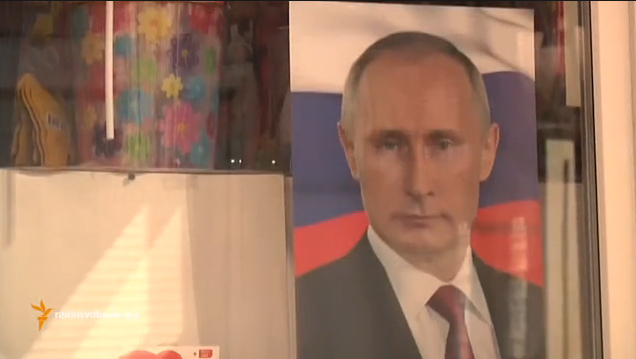 “Want to die” says Svetlana Aleksandrovna, you can see a photo of Putin in her room. Terrorists increase number of attacks on Ukrainian Army positions in Lugansk Region. 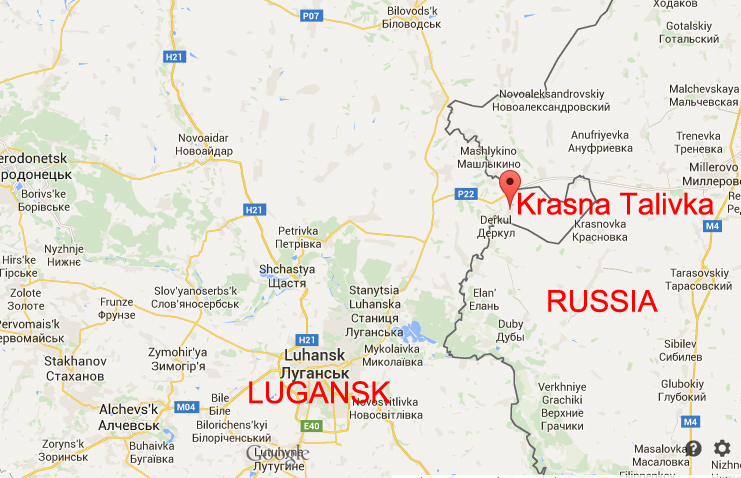 Military activity in Lugansk Region increased along the front line. Terrorists were attacking the suburbs of Troitske where Ukrainian Army positions are located almost all night, they used automatic weapon and grenade launchers. The last attack was registered today at 5:45am. There was military activity yesterday near Shchastya, terrorists used big caliber machine guns to attack positions of Ukrainian Army. Terrorists opened fire from their positions at Vesela Hora. 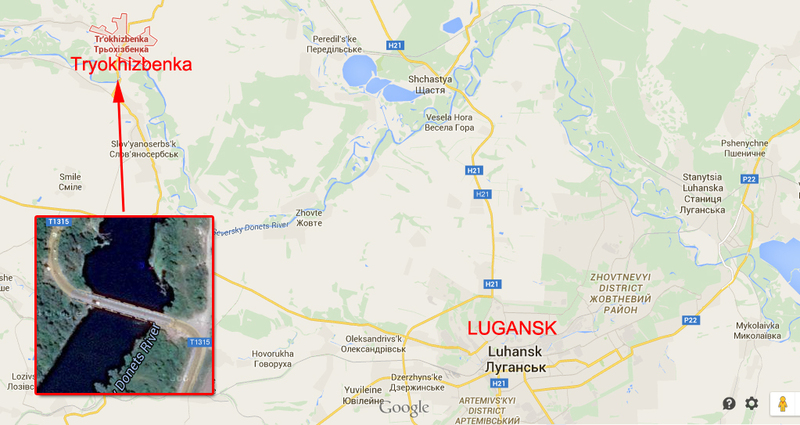 There was automatic fire on Bahmutka road near checkpoint #29 and near Stanytsia Luhanska. Local people were not affected, and there was no information about killed or wounded soldiers. One of the villages located on demarcation line, Krymske, was basically blocked because of bad weather. The dirt road from Svitlichne was ruined after snow and rain, regular transport couldn’t go there. Last week pension was delivered to Krymske and now soldiers are helping civil population with food. In case the situation with food or other essential things gets critical, all needed will be delivered using military vehicles. 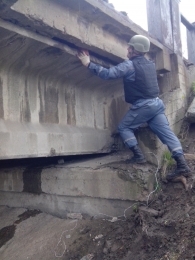 Road bridge demined in Lysychansk. 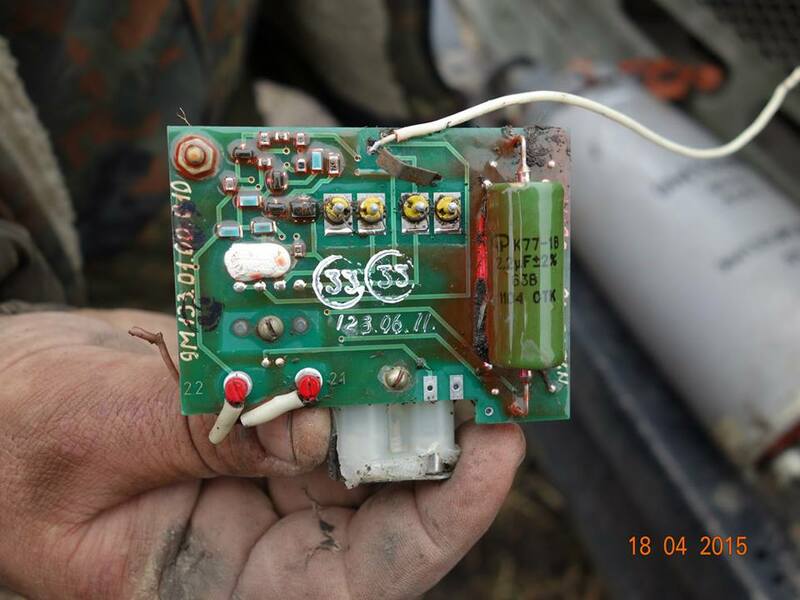 Yesterday at about 10:45am Anti-Terrorist Operation headquarters reported that a bridge between Severodonetsk and Lysychansk was mined. 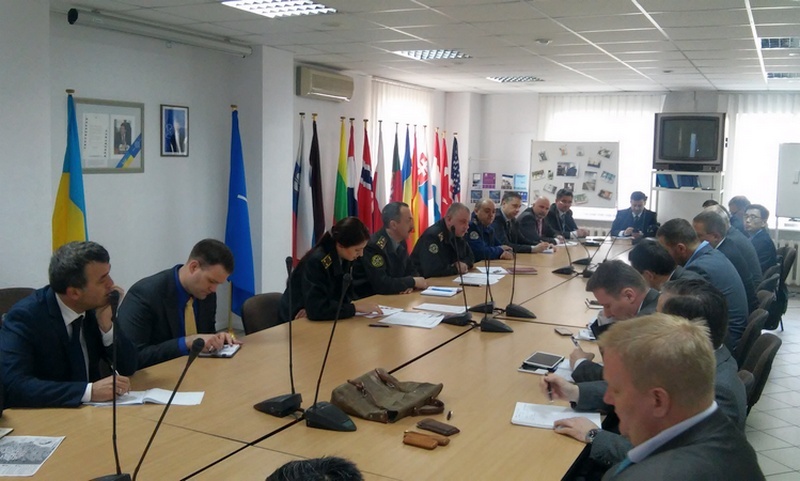 Pyrotechnic team of State Service of Emergency Situations of Ukraine was sent there. 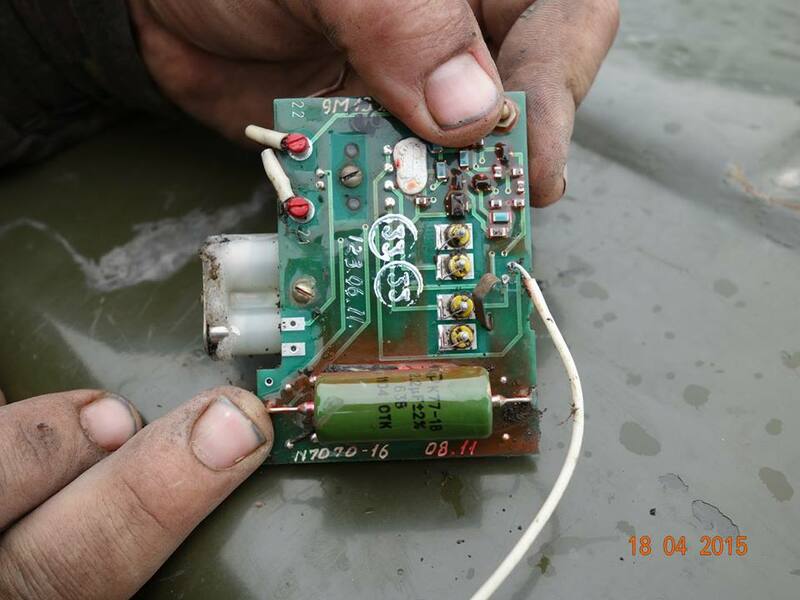 When pyrotechnic team arrived at the place, military explained to them, that the found explosive device on a bridge in Lysychansk over Bilenka River. 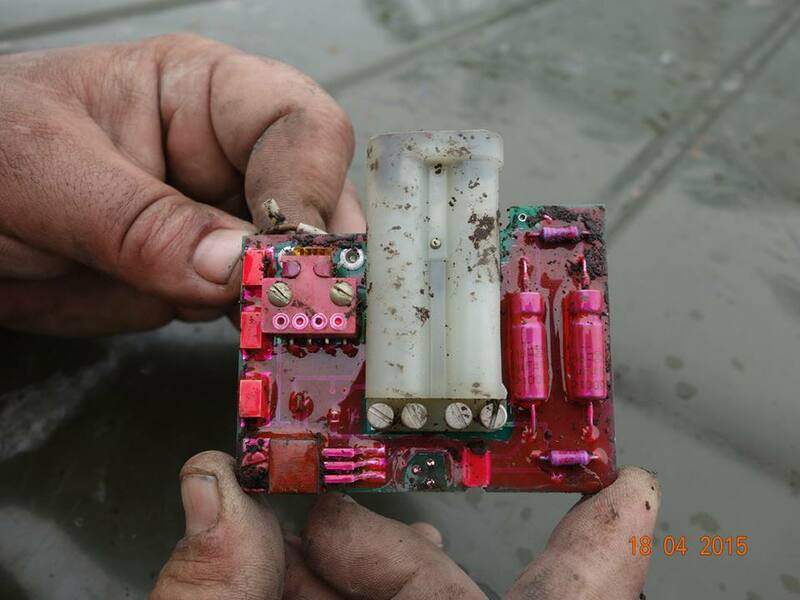 Pyrotechnic team together with soldiers checked the place and confirmed the location of explosive device. 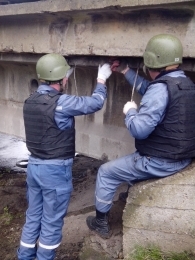 Pyrotechnic team started to demine the bridge immediately. Before pyrotechnic team arrive Ukrainian Army blocked the traffic over the bridge. 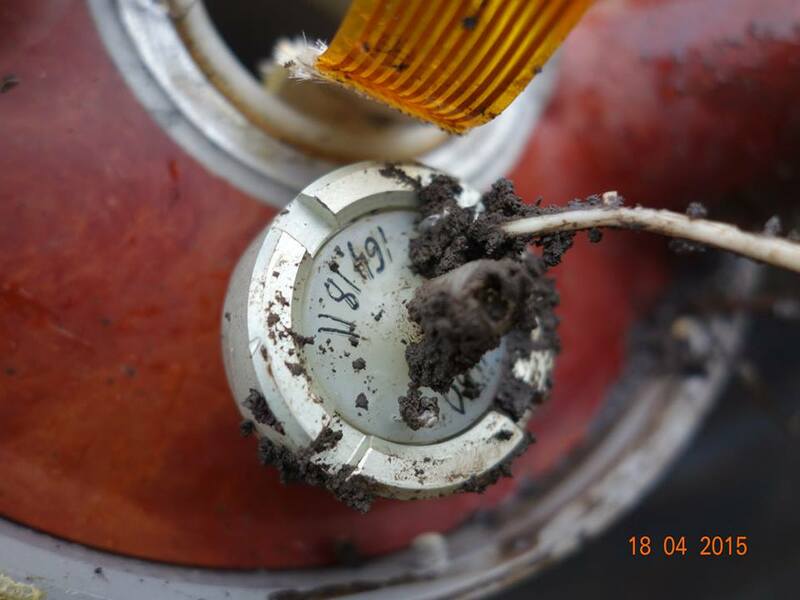 In total there were found big amount of explosive materials, 124 pieces of TNT charges 0.4 kg each, 120 pieces of ammonite charges 0.2 kg each, 5 pieces of electric detonators. All that was sealed and given to the Ministry of Internal Affairs. 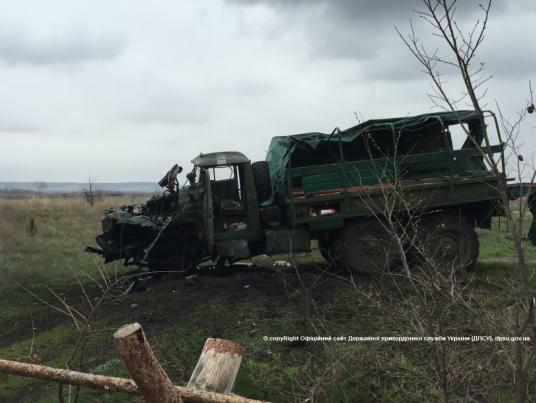 Ukrainian Border Guards vehicle blown up near Russian border. 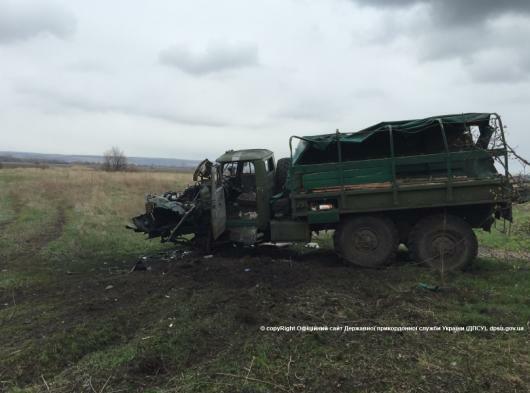 Yesterday Ukrainian Border Guard truck was blown up with the use of landmine. The mine exploded near Krasna Talivka village located on the border with Russian Federation (on the other side of the border is Milerovo of Rostov Region). The mine was set along a dirt road by terrorists saboteur group and it was initiated at the moment when “Ural” military truck with Ukrainian Border Guards was driving near it. Two soldiers of Sumy border guard unit (38 and 48 years old) were wounded and taken to the hospital. This is not the 1st terrorist attack in this area. 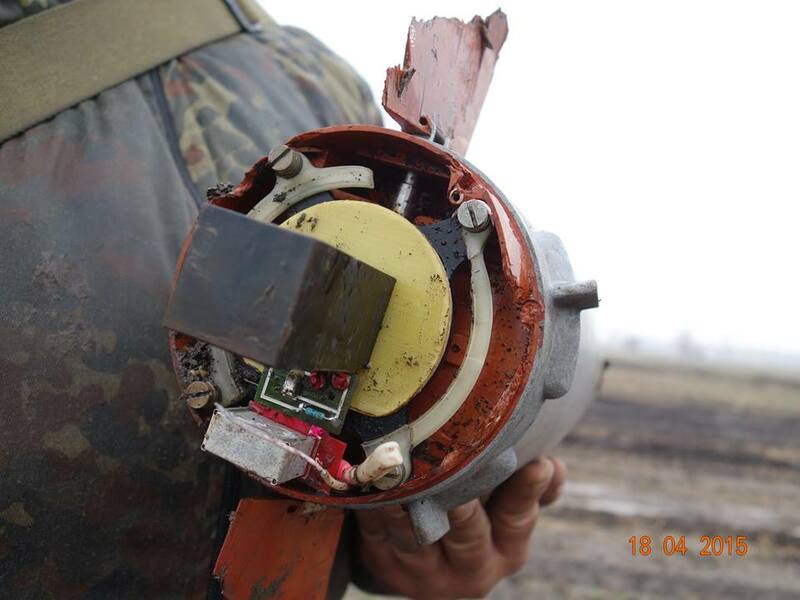 In November last year two Ukrainian border guards were wounded by a mine near Krasna Talivka. Truth about Russian officers and local thugs on the East of Ukraine. Russian businessman Bondo Dorovskikh who had some oil business and later worked in Moscow construction company decided to go to the East of Ukraine as volunteer. He was convinced that he was going to fight against fascism. 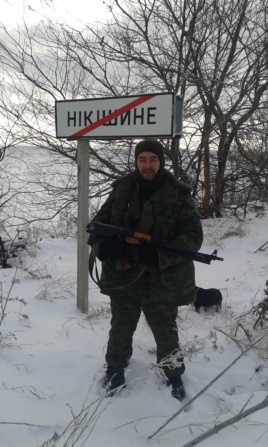 Dorovskikh was accepted to “Prizrak” (means “ghost” in Russian) brigade that was operating in Lugansk Region and later he was fighting on the territory of so-called Donetsk People’s Republic. But when he got to Donbass he found out that there is nothing like he was dreaming about, and “there was no Russian idea”. When he realized that he was deceived by Russian propaganda, Bondo Dorovskikh returned to Russia. “Everything got turned upside down in my head so much that I would like to join National Ukrainian battalions to fight for their independence”, wrote ex-militiaman. What he saw on the East of Ukraine, Bondo Dorovskikh told to Radio Svoboda. Read original article in Russian at svoboda.org Below is translation of full interview into English. – A lot of people go there to fight for money. You are businessman, wealthy person. What made you go to the war? – I really thought that Russia is in danger and mercenaries who want to conquer our country are fighting there, I though that Donbass is Russia’s outpost where we should be to protect our interests. – So you were ideologically motivated without material interest? – There was no question about materialistic interest, because I was buying all ammunition myself, bulletproof vest. It did cost me about 100 thousands rubles to go there and buy all needed. So that was not about money. And they don’t pay much there, now its 360 US dollars per month and not everybody even get that. Some people go there for adventure, some people go for combat experience… Everybody have their own reasons. Sure, most of those people have some disorders. Same with ISIS, why people go there? They think they will be needed there, they will be demanded. When you get there from the 1st minutes you understand that is not military division, that’s real gang. – Do you remember what was the last drop, when you finally decided to go there? Some TV show or read something in the Internet? – I had “Russia-24″ TV channel in my head all the time, where they showed newest Ukraine history. And after that I was telling myself that I wouldn’t go there, that I don’t need that. I was telling that to myself every morning. But as soon as I turn TV on, where they were talking only about that from the morning till the evening… Sure mass media influenced on my decision. – Have you been to Ukraine before, do you know this country? – No, never been there, that was my 1st visit. – Where did you go to become volunteer? – There are several option in the Internet. There is Inter-brigade from Limonov party “The Other Russia”, you send small application form to e-mail, they say that you need to come to Shakhty city for example, and from Shakhty they send you to the area where militia is located. I wrote to everybody, I wrote to Inter-brigade, there Donetsk People’s Republic recruit center opened in Mosocow, so I wrote there, they ave me contacts, approved my application. They approve all applications. Next they give you phone number. When you come to Rostov-on-Don, you call that number, they tell you where you need to come, where transit point is located. – So there is no verification, they don’t ask you about your military experience, don’t check if you are provoker? – No verification at all. There were even cases when somebody was crossing the border only with photo copy of his passport, some people even had no documents. When we arrived to militia, they just asked for my full name, that’s all. They take a photo of you and give you ID according to the name you told them. Когда мы приехали в ополчение, там просто спросили фамилию, имя, отчество и все. – And they give weapon? – Faster than anything else, they give you weapon right away. I was a sniper, I had automatic gun, I had riffle. I also had grenade launcher and machine gun, I basically had all kinds of automatic weapon. When we arrived at positions in Nikishino on the front line, there were local militia, they had one magazine for each automatic gun, and they didn’t have proper clothes, and we had everything, we were fully equipped, we had grenades, machine guns, RPG, ammo for them, absolutely everything. We even had 2 own cars that we could use for transportation. – All that was given to you in Rostov Region in a training camp? – No, they don’t give anything in Rostov Region, all that was given on the territory of Donbass. In Rostov Region they sent militiamen who used to be tankers to the training ground where they teach them and form tank units. They were getting weapon there. I saw it myself. Those tanks were transported to the Russia-Ukraine border on trawls where they crossed the border on their own and went directly to the combat areas. And I was given weapon in Donbass. – How did you cross the border? – We went through the fields. 1st time we came to border checkpoint legally, but I had restriction to go out of the country, so they didn’t let me go there. And after that the border guard told me that was not a problem and that some guys would help me to go through. And it happened, we got in a bigger group, about 15 people and during the day we went just through the fields, there was really no border there. – You had restrictions because of the debts? – I have little debt with bailiffs, so I was not allowed to go out of the country, I didn’t know about that. – Your unit was formed in Russia or when you already got to the territory of Donbass? – You join the unit already on the territory of Donbass. There are several transit points in Rostov Region, people get together there and wait for dispatch. Somebody wants to go to DPR, somebody wants to get to LPR, some people want to join “Prizrak” brigade, so they check that and send you where you want. 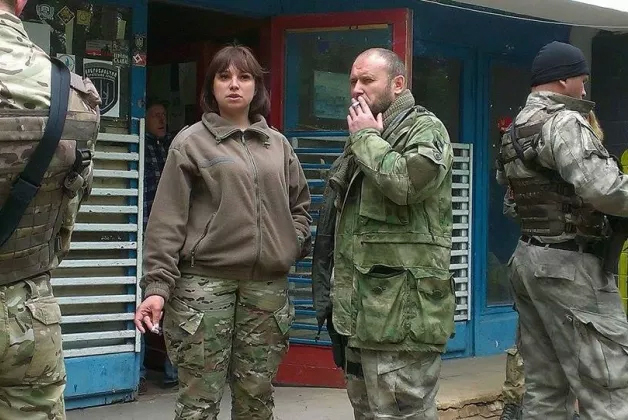 We came to “Prizrak” brigade at night, in the morning people from different squads come and offer to go anywhere you want, for example to Vergulevka where the front line was, or you can join intelligence unit, or tank unit, counter-intelligence and so on. – But you need to have some skills? Bondo Dorovskikh in Nikishine, Ukriane. ​– In theory yes, you need to have some skills. But what kind of skills do you need in counter-intelligence? What kind of counter-intelligence do they have there? They just have power, and they have no laws there. You need skills if you are a tanker for example. And what kind of skills do you need to shoot or to stand in a trench? Just stay while there is artillery war. And next all this herd starts to move, tanks go one way, and those tanks may have no radio connection, infantry can’t communicate with tankers, so tanks go one direction and infantry goes another direction and there is no coherency, no training. You really think that kind of herd could win the war? Do you know how they were winning in summer? SU jets were flying from Russia. One of the militiaman who was on anti-aircraft guns told me – “We got an order that SU jets will come now, don’t shoot at them”. There were Russian troops in summer, more likely. There were Russian jets, that I was told by militias. Personally, I haven’t seen Russian troops. As for officers, yes, I saw a lot of officers, “on vacation”, who were there. 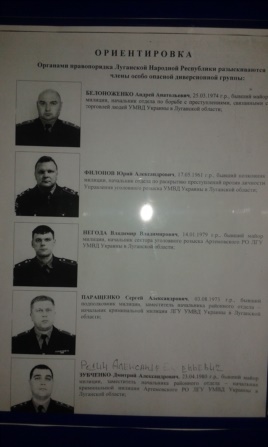 There were few regular Russian Army officers in “Prizrak” headquarters. – Have you talked to them or just saw accidentally? – I knew them very well, I have been to their headquarters very often. I knew the brigade’s chief of Intelligence, chief of staff, chief of staff of lower rank, used to hang out with them when volunteers were coming. I often communicated with chief of Intelligence, live close to each other, both Russians. I was seeking intelligence, so we communicated more. 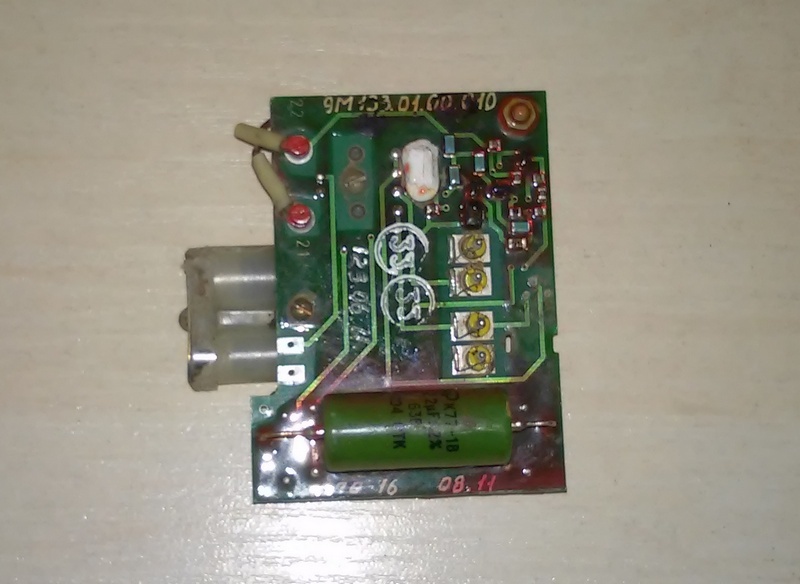 – What “Prizrak” brigade was doing while you were there? – When I was in “Prizrak”, the brigade controlled all Alchevsk city. 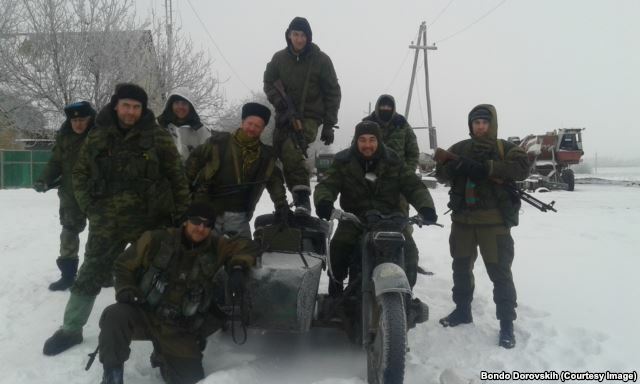 Our combat units were on the front line in Vergulevka, in Komissarovka and in couple of other villages. There are about 100-150 people stationed in Vergulevka, small units in Komissarovka, and the rest were in Alchevsk. 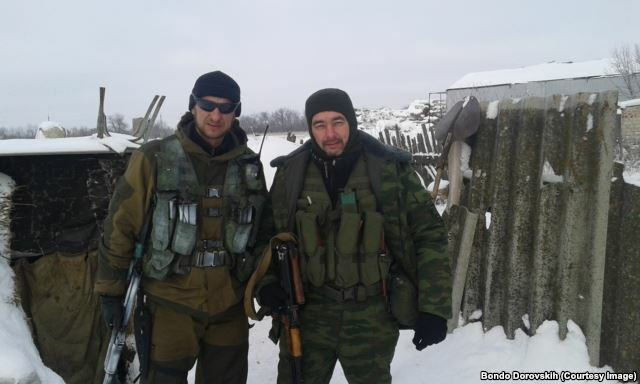 In face, DPR and LPR didn’t recognize “Prizrak” brigade. They had internal confrontation, they were limiting weapon supply. At some point there was not much weapon supply from Russia, no artillery, no tanks, but somehow they managed to solve such problem in “Prizrak”. Several hostels: volunteers were constantly coming from Russia and from other countries too. The only men who were training were Spanish, they had international squad with people from Spain, Italy, France. As for others the routine was like this: squad commander wakes up, does roll-call, put everyone in a line, and same thing in the evening. The rest of the time militiamen walk around Alchevsk, collect metal, take off metal gates somewhere, looting, sell that metal to have money to buy alcohol and cigarettes. They are on their own. Get drunk somewhere and shoot each other. One time one man got drunk and wanted to through grenade in a room, but he was neutralized. This kind of peaceful life. If somebody gets bored, he goes to the front line. – So men were not paid at all, they had to earn money collecting scrap-metal? – Actually yes. Some men were selling weapon. Russians collect money, radio station, send ammunition, bullet-proof vests, they were selling all that to get drunk. That was the life there. – How many locals are in “Prizrak” brigade compared to people from Russia and other countries? – I think about 10 percent, maximum 30 percent, all the rest are locals. – What was the attitude of local population towards you? – When we arrived to Alchevsk, next day we went to the market to exchange rubles, we met old lady, who was saying: “You are against us, right?”. After that in about half an hour we went to the church, some woman came to me and said: “We are going to have elections soon, who should we vote for?”. I tell her vote what your heart tells you. Nobody can tell you who to vote for? And she said: “We don’t need Putin, we don’t want to join Russia. We want Ukraine to be here, independent Ukraine.” That was the 1st that I started to see right after I got there. Later in Nikishine village I approached one woman and asked her. When Nikishine was under Ukrainian Army, what did they do here, there was no laws? And she says: “No, everything was good, we had nothing against them. But when OPLOT came (that’s Zakharchenko’s brigade, the leader of DPR), they told us to get out of our house and simply put the cars close to the entrance and put all stuff out of the houses there, they just robbed us. Russians, please save us, we are not afraid of Nazi, we are afraid of OPLOT, we are afraid of militiamen!”. I met such people there. And there some statements from other people who simply consider us to be occupants. They have a question – Why did you come here? – Locals who were in your brigade, were they ultra-patriots of Donbass, or they had mercantile interests, or they simply were indifferent to politics? – I think they don’t care about politics. Mostly those are people who have been in jail before, many of them several times. I have photos that were in out barracks, I took a photo of them. The comicality is that those people who were in jail before are looking for former police officers. No, they are very far from politics. In DPR they were getting paid, so they went there just to outstay the war and to get paid at least some salary. The rest of the people were scumbags who were given weapon. Being in militia they have some power. There are no laws, and when you are driving on the road, they just go on red traffic light. If locals see armed people on the road, sure they always let militiamen go, because militiamen are armed. Militiamen say that they are respected, so they can go on red light and they shouldn’t stop. – You are intelligent person, it was probably hard for you to find common language with them. How your did you deal with them? – I almost didn’t deal with them at all. I had a friend, he lived in Germany for 10 years, I was communicating with him. There were few Russians. People coming from Russian are a little different, not all of them, but there few that you can communicate with. Spanish guys, there was one young guy from Madrid. There were some people to communicate with, but not much. That is probably why I left. I wanted to leave Alchevsk right away, but I wanted to go to the front line as well and see what was going on there. I started to sympathize the opposing side there. Because there was cease-fire agreement and they were shelled by heavy artillery, by MRLS, simply burnt by “Grad”. When you hear on the radio that our guys burnt two “URAL” trucks with soldiers, when you hear people screaming, of course you understand that everything is totally opposite that you though it was. You feel sorry for that side that is simply being wiped out and they were killed by regular thugs, who didn’t care who to fight against, that was just their criminal way of life. – That was right after signing 1st Minsk agreement? – Yes. I was in Nikishine since November, November-December. It was absolutely same thing in Vergulyovka. The opposite side was bombed from our side. – And did Ukrainians keep the cease-fire and they didn’t respond? – No, they also sometimes shelled us pretty dense. But I was watching at casualties, ours constantly raid that side. Two “URAL” trucks were burnt when I was there, next they hit a tank and APC. Every time they get drunk they went to raid Ukrainian checkpoint. There were no raids from that side. Although it was clear to me that was easy to kill us all. There were 80 of us in that Nikishine, it would be easy to smash us from Kamenka, there were a lot of enemy forces there. They simply didn’t have a wish to do that. – Did you have a lot of killed in you squad? – No, from our side in Nikishine for one month only one man was killed, he was wounded in the head by shrapnel. On the other position where squad commander with nickname “Biker” was, I haven’t heard about people being killed. – You said that “Prizrak” brigade had conflict with DPR. What were the reasons for the conflict and how it expressed? – DPR and LPR didn’t want to recognize “Prizrak” brigade, there was some political problem. They were offering to Mozgovoy to join LPR, but not as single division, but in small parts, so he would lose all the power. Sure he didn’t agree on that, he wanted to stay independent. – You personally talked to him? – Just said hi, but we didn’t communicate. I was communicating with Strelkov, but that was in Moscow. I accidentally met Strelkov and we talked about Mozgovoy. He said that was the only leader he still trusted. – When was the 1st time you felt disappointment – when you understood that what you were told on “Russia-24″ TV channel doesn’t represent reality at all? Was it slow process of understanding or you felt that from the very beginning? – From the very beginning. As soon as we crossed the border, 1st what we saw after 5 minutes that was a fight between militiamen. After about 2 hours convoy arrived, Mozgovoy’s Deputy Brigade Commander Nikolaich was walking with a gun and wanted to shoot 2 drivers. Immediately I realized where I got to, the was no sign of army. I was disappointed right away and this disappointment just grew bigger with time. – So why did you stay there for six months? ​– It was like this: I came in July, spent one week there, left, came back to Russian Federation. In Moscow I accidentally met Strelkov, just met him in a shopping center on Rublevsky highway. And I started to think that maybe I didn’t see everything, maybe some other places are different. Initially I wanted to go to join Strelkov, I thought that maybe something depends on a commander. Later I went there again, came there in October. I spent some time in “Prizrak” brigade and got convinced that everything was the way I thought. After that I went to DPR, in Nikishine, and I saw absolutely same thing there. I even talked to other people to see how it is in “Zarya” battalion in Lugansk People’s Republic, it was all the same everywhere. – What do you think, how long self-proclaimed republics are going to hold on? – Without Russia’s support all this wouldn’t exist. Russia wants to continue to support this movement, so militias will hold on for long time. – What would you like to say to listeners from Russia, to those people who are thinking if they should help self-proclaimed republics or not? ​– I would like to advise not to go to Donbass, that is fake patriotism. There is no Russia there, there is real aggression. You will simply get to a gang. When I recently saw information that policeman from Moscow quit his job and that there, I was shocked. He went straight into real hellhole. I don’t know how he is going to live among such people. I would like to advise people not to go there, because that has nothing to do with protecting your motherland. They show us on TV as if there was already the Great Patriotic War, but in reality that is not the Great Patriotic War, that is just real aggression. We invaded territory and Russian authorities support the terror there. If we were not going there, if Russia wasn’t helping militias, there wouldn’t be thousands killed, nothing would happen there at all. What did it start from? 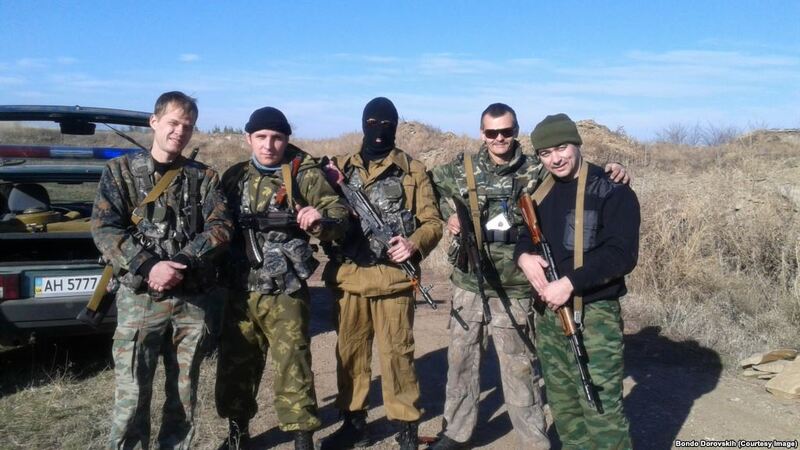 Strelkov came there with his group. Strelkov is a military guy, he would fight all his life if has such possibility. I was so ardent supporter of this movement that I was agitating people to go there, but when I was coming back, Federal Security Service (FSB) stopped me on the border, they talked with me for a long time. I told them straight everything, same as I am telling to you now. Besides, they told me that a week before me another 180 Russians got out of there. They only asked me one thing, don’t tell anyone about this. I told them, I will come back and will be telling people everywhere in social networks not to go there, because everything is absolutely not like they show us on TV. There are murders, robberies. Furthermore, from the 1st moment I realized that if somebody can kill me here, more likely that would be not Ukrainian Army, not the enemy, but some drunk militiaman can just shoot me. – Is it easy to leave the squad? You just through your riffle on the table and say, that’s it, I am going back to Russia? Or you have to do that secretly? ​– You are volunteer, you say, that’s it, enough, I want to leave. In Nikishine they were asking me to stay, because there were not so many of them there, they were saying, stay, where would you go? I say, ok, I stay another week. And again after a week. As for locals, I got impression that they were there against their will. In about two weeks, I just gave my riffle to them, because it was assigned to me, there was opportunity to leave next day, a car was going, I gave them my riffle and said, I am leaving to Russia. I had no obligations to them. Commander of your squad just comes there 2 times a week for half an hour and quickly runs away from there, there are no commander, nobody. I am like cannon fodder there. And there is nothing to fight for. The most important thing is that there is nothing to fight for! I would be glad to be useful, but that’s not a kind of war that is worth risking the most valuable thing you have. – Your political views changed to the opposite during this time? – Yes. Furthermore, I had negative attitude towards our current authorities, because before I had my own pretty successful business, oil depot, and large wholesale business. And later I lost it because of our authorities. But one year ago I changed my opinion on Putin and current authorities, I though he was so great. And now this veil is gone.